Senior wideout Justice Shelton-Mosley leads the Ivy League with 132.0 all-purpose yards per game. That’s the number of games Harvard has played since its last Saturday contest. The number of games Harvard has played since playing under the sun. The number of consecutive years Harvard will have traveled to Ithaca, N.Y., to challenge Cornell at its home Schoellkopf Field. Two is a significant number for other reasons too. Last year, the Big Red was the Crimson’s second loss. This year — with Harvard (2-1, 1-0 Ivy) entering the grudge match on the heels of its first loss of the season to Rhode Island — history could repeat itself. A loss this weekend would be the second divisional defeat for Cornell (1-2, 0-1). In the Ivy League, two losses is for all intents and purposes the kiss of death. A team with two or more in the loss column hasn’t so much as shared the Ancient Eight crown since 1982, and that was only one of two such instances since the formation of the Ivy League. 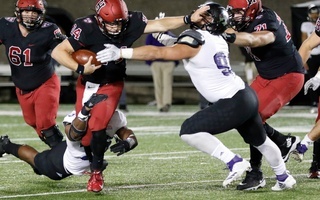 The Crimson’s rushing defense bucks the two trend, ranking number one in the nation allowing an average of just 50.0 yards on the ground per game. If you extrapolated that out to yards per carry, opponents average just 2.1 each snap. Leading the defensive front is senior Richie Ryan with 2.5 sacks, senior Wes Ogsbury with two interceptions and sophomore Jordan Hill with 19 tackles. And it is at the line of the scrimmage, with the Big Red in possession and Harvard on the defense, that this weekend’s game is likely to be won or lost. Cornell enters the afternoon tilt averaging 165.7 rushing yards and 155.3 passing yards per match — by all means a balanced offensive attack. The Crimson doesn’t think the Big Red will come out so balanced on Saturday. If past precedent is any indication, Miller will likely be proved correct. When the two squads met at Schoellkopf Field in 2017, the Big Red put the ball on the ground 59 times. The strategy was ultimately successful, earning Cornell its first win in the series in 11 seasons. Cue the obligatory quote about fixing things that aren’t broken. Last year’s win invigorated the team from Ithaca, as it went on to win the next two consecutive divisional matches and pushing itself into Ancient Eight title contention in November for the first time since 2000. Harvard’s defensive line isn’t the only strong facet of the team. Senior wideout Justice Shelton-Mosley is tearing up defenses. The senior currently leads the conference in receptions per game (7.7) and all-purpose yards per game (132.0). The performance is historically significant as well, ranking third in program history for career receptions (147) and fifth in reception yards (1,894). While the Smith to Shelton-Mosley connection has earned the Crimson yards through the air, coach Tim Murphy will tell you a good pass game is predicated on a team’s ability to run the ball. Harvard has that ability. One of the three sophomore running backs taking snaps, Aaron Shampklin leads the conference in rushing with 112.0 yards per game. Overall the visiting team — like the Big Red — is very balanced with an average of 210.0 yards through the air and 201.3 rushing yards per game. But this isn’t the Cornell team of years past, back when the Crimson could essentially sort this match into the win column before the season had even started. Last week, the Big Red won its first game of the season. The team didn’t just win, it trashed Sacred Heart — an unbeaten Sacred Heart team. 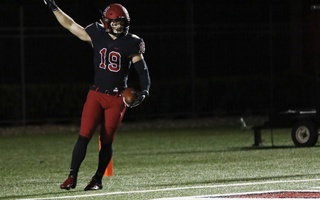 Prior to last week’s matchup, The Pioneers had allowed exactly 34 points total in their preceding three games. Cornell scored 36 in the first half. It was the Big Red’s first win ever in the series. The team’s offense is led by junior running back Harold Coles. Averaging 7.8 yards per carry, the back has 217 yards on the season. Defensively, the team boasts eight players that have double figure tackle counts, with junior Jelani Taylor leading the crew having put 21 people on the turf. For this perennial underdog, a real point of pride has been the special team core. After last week’s thrashing of Sacred Heart, the Ivy League honored junior David Jones with the division’s Defensive Player of the Week award. Jones intercepted two passes, taking one all the way back for six and returning a kick for a touchdown as well. 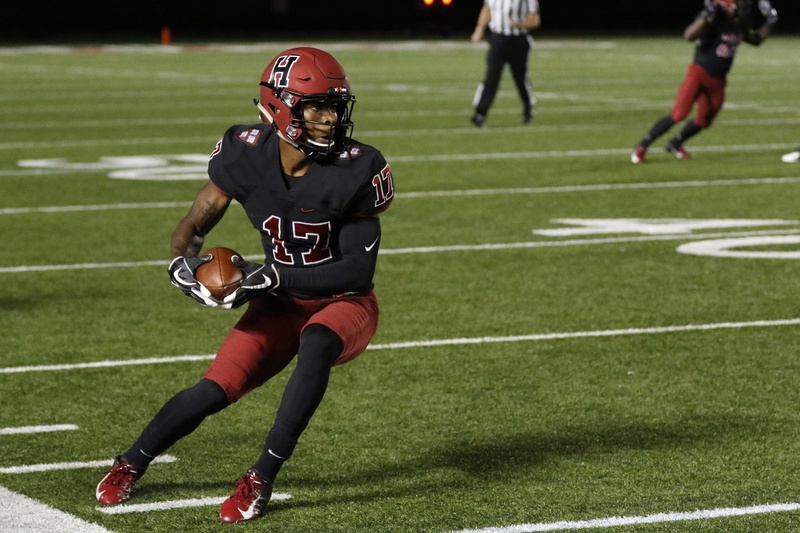 In Harvard’s loss to Rhode Island, the team’s only points of the second half came on a 97-yard kickoff return for touchdown. The six-point play ultimately determined the game as the Crimson lost by seven. Saturday’s game will be the most recent rendition of a long and storied series. The match will be the two squads’ 83rd game. Harvard leads the series 47-33-2, but the Big Red’s win is still fresh in the minds of the Crimson.